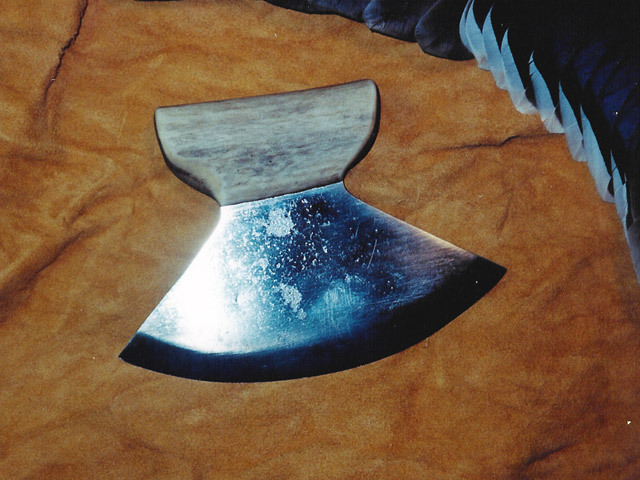 This was my first ulu and was made as prototype so it is a little rough around the edges. Convex ground blade from unannealed 3/32″ thick bandsaw blade from a lumber mill (possible L-6). 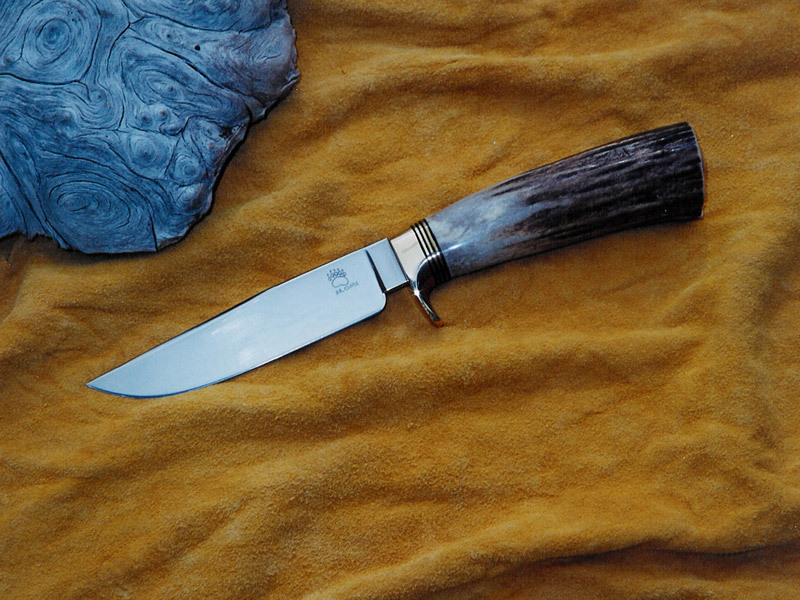 The handle is elk antler (from what is called the “web” of the antler) that has been slotted and fitted over a partial tang. BL (tip to tip)=6″, TL (handle to edge)=4 1/4″. Since I made this knife in 1996 I have used it in my kitchen for almost all of my cutting chores and thought it could use a better heat-treat, I think it is truly one of the most utilitarian designs around. It makes sense, since it is one of the oldest knife designs in the world. 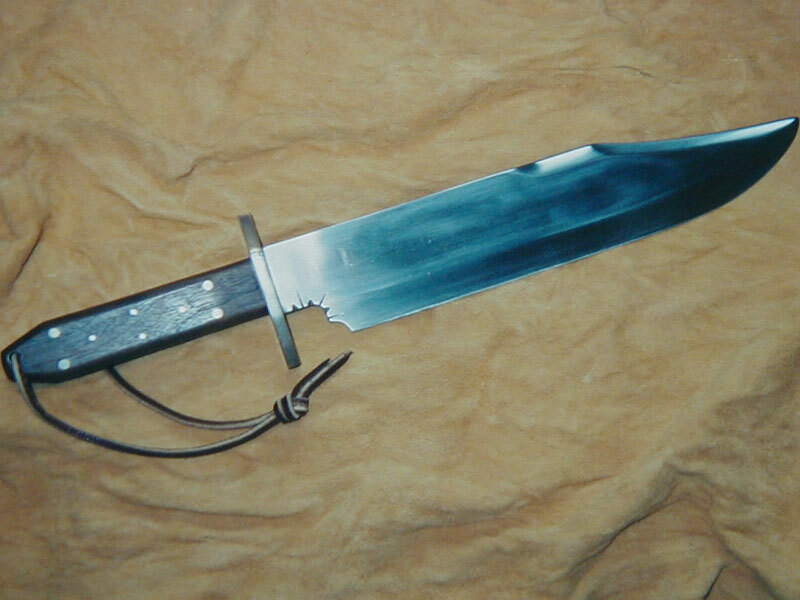 This is an example of a knife where the handle is held on only by epoxy and a very tight fit. Though I wouldn’t recommend that method of handle attachment in most knives, it has not failed during over six years of regular use. A medium utility knife made from a reground “carbon steel” blade imported from Solingen, Germany. Brass guard with black and brass spacers, a Sambar stag handle and a pewter bear paw concho at the pommel. BL=4 7/8″, TL=9 3/4″. Many of my earlier knives were made from reground pre-heat treated blades. It meant I didn’t have to deal with heat-treating, often didn’t have to grind the master bevel (what I felt was the hardest part to learn) and could focus on learning to make good handles and solder guards. This is actually one of my favorite knives, mostly because of the handle; a material that is hard to find anymore. A large full-tang bowie I reground from a larger imported knife I purchased at a flea market. Convex ground 1/4″ thick blade of some kind of “stainless” steel (440c?). Brass double guard, black walnut handle with brass and aluminum pins, black spacers and a brass lined lanyard hole. On one side (the left side) are my wife’s initials done in stainless steel wire pins. BL=10 1/2″, TL=15 1/2″. A large and rather heavy knife. As an experiment I did carry it on two backpacking trips in the Cascades. 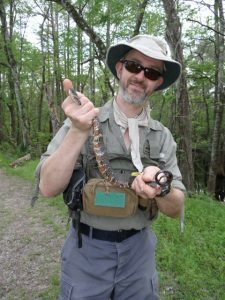 I quickly learned the benefits of smaller knives, though it did serve well as a stand in for an ax during an unexpected freezing-rain storm. I also made a slab sheath for it. My first and only, so far, miniature knife. The blade was forged from a scrap of bandsaw steel and has a blacktailed deer antler tine for the handle, wrapped in imitation sinew. TL=~3 ½”. 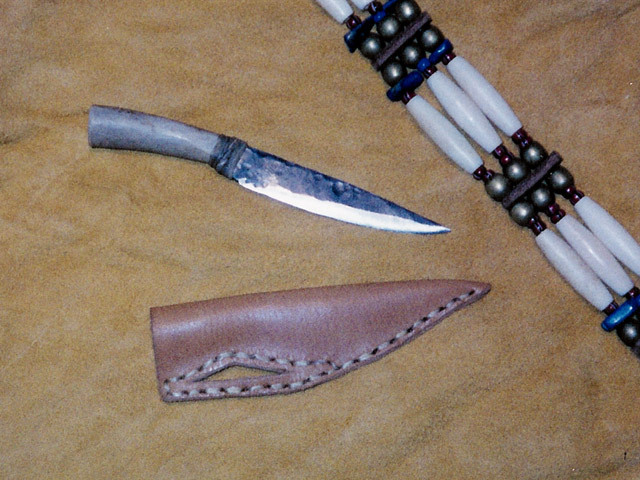 I made this little primitive-style bowie knife for a relative that makes period dolls and wanted a knife for a Native American from the Great Plains. This was a fun project.